© Ganss and Hoffmann; Licensee Bentham Open. Ependymins are secretory, calcium-binding sialoproteins which are the predominant constituents of the cerebrospinal fluid of many teleost fish. A bound form of these regeneration-responsive glycoproteins is associated with collagen fibrils of the extracellular matrix. Here, the tryptophan fluorescence of ependymins was monitored at various Ca2+ concentrations. Two distinct states were identified with a relatively sharp transition at about 1 mM Ca2+. In agreement with previous circular dichroism measurements, this strongly supports the hypothesis that a calcium-induced conformational change is important for the interaction of ependymins with components of the extracellular matrix. Such interactions with constituents of various basal laminae would also explain the important roles of piscine ependymins as well as invertebrate and mammalian ependymin-related proteins for cell adhesion processes and cell migration. Keywords: Ependymins, MERP, calcium binding, extracellular matrix, tryptophan fluorescence, cell adhesion molecule, learning and memory. Ependymins are unique calcium-binding secretory proteins of the endomeninx of many teleost fish (for review, see ). Here, fibroblast-like cells synthesize these glycoproteins together with a number of extracellular matrix (ECM) molecules [1-4]. Fish ependymins are highly divergent [5-7]. The most conserved feature of piscine ependymins, other than the sequence F-E-E-G-V-x-Y-E/D-I/L-D between the two canonical N-glycosylation sites , is the presence of sialic acid residues in the N-linked sugar moiety . As also shown for other extracellular proteins, e.g. fibrinogen , these acid structures are responsible for the calcium-binding capacity of ependymins . An ependymin-related gene has been detected also in human where it is expressed mainly in brain, heart, and skeletal muscle. This gene was originally termed UCC1 because it is up-regulated in colon cancer . Nowadays, this gene and its various mammalian homologs are named MERPs . Ependymin-related genes are also present in invertebrate deuterostomes such as sea cucumbers  as well as protostomes . Generally, there is only little amino acid sequence similarity between these ependymin-related proteins. Strictly conserved are four cysteine residues, a tryptophan residue and a few other positions. Furthermore, all ependymin-related proteins contain at least one N-glycosylation site. Originally, piscine ependymins were detected when studying neuroplasticity in the goldfish (for review see ). Also interference of anti-sense ependymin-mRNA with memory consolidation has been reported . However, ependymins are also attracting increasing interest because they share several characteristics with glycoproteins involved in cell contact phenomena . For example, in the goldfish, infusion of ependymin antibodies blocks the sharpening of the regenerating retinotectal projection , and increased synthesis of ependymins in the optic nerve has been reported during its regeneration . Generally, an anti-adhesive potential of ependymins would be in agreement with their synthesis in the endomeninx, where they could be responsible for a diffuse projection of posthatching retinal axons . Soluble ependymins are the major protein constituents of the cerebrospinal fluid (CSF) of many teleost fish [5, 6, 18, 19]. Here they bind approximately 66% of the soluble Ca2+ (for example, trout CSF contains about 2.7 mM soluble Ca2+) . Interestingly, the expression of ependymins is strongly cold-induced . A bound form of these glycoproteins is associated with the brain ECM, collagen fibrils being the predominant targets . Thus far, the precise mode of interaction is not known. However, the calcium-binding capacity of ependymins  may be important for this association because self-assembly of the extracellular matrix is known to be Ca2+-dependent . Circular dichroism (CD) measurements have revealed that binding of Ca2+ effects the conformation of trout ependymins by changing their tertiary but not their secondary structure . The drastic change of the predominant signal at 288 nm is a strong indication that the single tryptophan residue at position 120  is affected by this transition . However, the CD measurements covered only the range up to 2 mM Ca2+ and a clear statement concerning the transition point was not possible with this method. Here, we report on extended studies where the tryptophan fluorescence of ependymins from the rainbow trout has been monitored at various Ca2+ concentrations. Ependymins from this quasi-tetraploid species are encoded by two homologous genes. Both gene products contain a single tryptophan residue  which is strictly conserved in ependymin sequences of all species analyzed thus far [6, 7]. Ependymins (Mr on SDS polyacrylamide gel electrophoresis: ≈ 37k) were purified from the CSF of rainbow trouts (Oncorhynchus mykiss) via a two step FPLC procedure using ion exchange and hydrophobic interaction chromatography as described previously . Purified ependymins consisted of three glycoforms termed A, B, and C  where form A contributed to more than 95% and form C was detectable only in traces (data not shown). Specific monitoring of the tryptophan fluorescence after excitation at 295 nm has been established as a method for the detection of conformational changes of proteins [22, 23]. Thus, 180 μg FPL-purified trout ependymins were dissolved per ml of 14 mM NaCl, 10 mM Tris/pH 7.4, 10 mM CaCl2 and a fluorescence spectrum was recorded with a RF-5000 spectrofluorometer (Shimadzu Deutschland GmbH, Duisburg, Germany) at 20°C using thermostat-controlled quartz cells (Hellma, Mühlheim, Germany) of 1-cm path length. Additionally, the fluorescence spectrum was recorded after complete complexation of Ca2+ by EDTA/pH 7.5. A maximum was observed for both Ca2+ concentrations at 335 nm. Then, FPLC-purified trout ependymins were dissolved in 14 mM NaCl, 10 mM Tris/pH 7.4, 10 mM CaCl2. Different Ca2+ concentrations were titrated with various amounts of EDTA/pH 7.5. After excitation at 295 nm, the tryptophan fluorescence of each concentration point was measured at 335 nm. The fluorescence at each concentration point was measured three times (after equilibration for 7 sec). 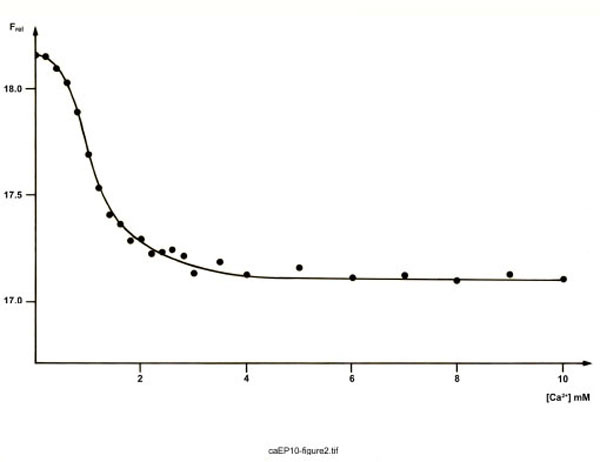 Each relative fluorescence measured was corrected for its actual ependymin concentration. Two independent experimental series were carried out with trout ependymins. 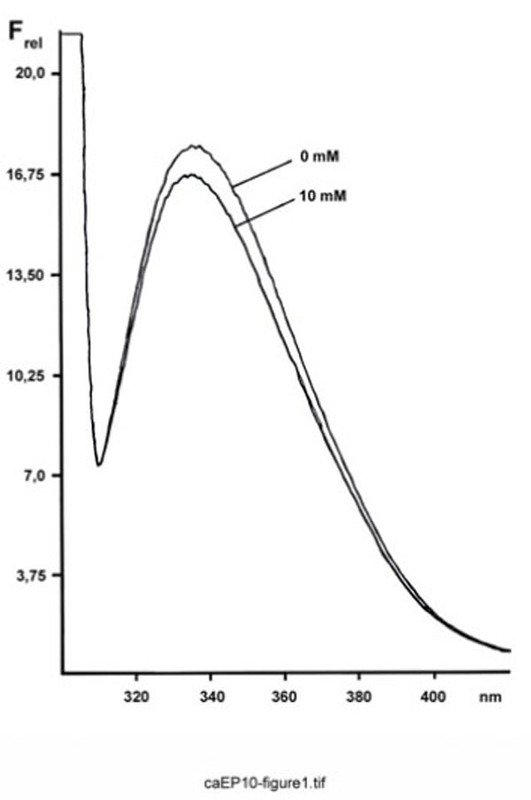 When ependymins at various Ca2+ concentrations were excited at 295 nm, the corrected steady-state emission spectra originating from the single tryptophan residue were comparable in shape, as well as in the wavelength position of the maximum fluorescence intensity (λmax = 335-340 nm) (Fig. 1). In contrast, the relative intensities at λmax varied at different Ca2+ concentrations. Fluorescence spectrum of FPLC-purified ependymins from the rainbow trout. Shown is the relative emission fluorescence of trout ependymins (180 µg/ml) between 300 and 420 nm (Frel, in arbitrary units; excitation at 295 nm) at 10 mM Ca2+ and after complexation with EDTA. Fig. (2) outlines the result of a typical experiment measuring the fluorescence at 335 nm as a function of the Ca2+ concentration. Generally, two states of ependymins are observed. There is a relatively sharp transition from the apo(Ca2+-free)-proteins to the holo(Ca2+-loaded)-proteins at about 1.0 mM Ca2+. Interestingly, this is very close to the free Ca2+ concentration in the trout CSF (which is about 0.9 mM) and below the total Ca2+ concentration of trout CSF (which is about 2.7 mM) . Tryptophan fluorescence of FPLC-purified ependymins from the rainbow trout. Shown is the relative emission fluorescence of trout ependymins (191 µg/ml) at 335 nm (Frel, in arbitrary units; excitation at 295 nm) as a function of the Ca2+ concentration. Each point represents the mean of three measurements. Thus, the holo-state can be considered as the native state of ependymins. Here, similarly to osteonectin/SPARC/BM-40 [24-26], osteopontin, bone sialoprotein and BAG-75 , Ca2+ may trigger maintenance of a native structure which is essential for interaction with the ECM. Also aggregation of ependymins to naturally occurring multimers with Mr of about 200k  may require Ca2+. This processes is particularly reminiscent of the aggregation of fibrinogen at physiological millimolar Ca2+ concentrations, where sialic acid residues represent the low affinity calcium-binding sites . Whether the apo-state of ependymins is of any biological importance is not known thus far. As far as it is known it is always the Ca2+-bound state of a Ca2+-binding protein which is active . Interestingly, there are multiple reports on severe fluctuations in the extracellular Ca2+ concentration of the brain [30-34]. They could locally be sufficient in order to affect ependymins. The precise nature of the apo-state has not been clarified currently. However, in contrast to a previous report , we have not succeeded in the precipitation of ependymins into insoluble aggregates solely by depletion of Ca2+. Consequently, we exclude that the apo-state represents an insoluble form of ependymins. Taken together, the Ca2+-binding capacity of cold-induced ependymins would be in line with their postulated function for Ca2+ homeostasis in fish brain . Furthermore, the results presented here extend our previous CD measurements which showed a Ca2+ dependent gradual change in the tertiary structure of trout ependymins with only a slight discontinuity at about 1 mM Ca2+ . Interestingly, both this discontinuity and the sharp conformational transition observed by monitoring the tryptophan fluorescence occur at the same Ca2+ concentration. Thus, both studies indicate a Ca2+ dependent conformational change of ependymins. However, the tryptophan measurements reported here defined the transition point more clearly. These results also support our hypothesis that this conformational transition is essential for association of ependymins with ECM proteins presumably of collagen fibrils . Thus, defining precisely the molecular mode of this interaction might be a crucial step for understanding the molecular function of piscine ependymins in the future. Furthermore, the Ca2+-triggered conformational changes observed for piscine ependymins could also have some relevance for invertebrate and mammalian ependymin-related proteins. Generally, Ca2+-dependent interactions of ependymins/ependymin-related proteins and ECM proteins such as collagens would be perfectly designed to regulate cell adhesion and cell migration particularly on various basal laminae. This would explain why these enigmatic proteins play important roles for a variety of physiological and pathological processes such as neuronal regeneration and plasticity in fish (for review, see ), intestinal regeneration in sea cucumbers , tumorigenesis of the human colon , and remodeling of the respiratory mucosa in a murine asthma model . We thank Dr. J. Stadlmüller and E. Weiher (Genzentrum, Munich) for their advice during the tryptophan fluorescence measurements and Dr. C. Falkner (Institut für Klinische Chemie, Munich) for her atomic absorption measurements. Hoffmann W, Schwarz H. Ependymins: meningeal derived extracellular matrix proteins at the blood brain barrier Int Rev Cytol 1996; 165: 121-58. Königstorfer A, Sterrer S, Hoffmann W. Ependymins are expressed in the meninx of goldfish brain Cell Tissue Res 1990; 261: 59-64. Rinder H, Bayer TA, Gertzen E-M, Hoffmann W. Molecular analysis of the ependymin gene and functional test of ist promoter region by transient expression in brachydanio rerio DNA Cell Biol 1992; 11: 425-32. Schwarz H, Müller-Schmid A, Hoffmann W. Ultrastructural localization of ependymins in the endomeninx of the brain of the rainbow trout: possible association with collagen fibrils of the extracellular matrix Cell Tissue Res 1993; 273: 417-25. Müller-Schmid A, Rinder H, Lottspeich F, Gertzen E-M, Hoffmann W. Ependymins from the cerebrospinal fluid of salmonid fish: gene structure and molecular characterization Gene 1992; 118: 189-96. Müller-Schmid A, Ganß B, Gorr T, Hoffmann W. Molecular analysis of ependymins from the cerebrospinal fluid of the orders Clupeiformes and Salmoniformes: no indication for the existence of an euteleost infradivision J Mol Evol 1993; 36: 578-85. Orti G, Meyer A. Molecular evolution of ependymin and the phylogenetic resolution of early divergences among euteleost fishes Mol Biol Evol 1996; 13: 556-73. Ganss B, Hoffmann W. Calcium binding to sialic acids and its effect on the conformation of ependymins Eur J Biochem 1993; 217: 275-80. Dang CV, Shin CK, Bell WR, Nagaswami C, Weisel JW. Fibrinogen sialic acid residues are low affinity calcium-binding sites that influence fibrin assembly J Biol Chem 1989; 264: 15104-8. Nimmrich I, Erdmann S, Melchers U, et al. The novel ependymin related gene UCC1 is highly expressed in colorectal tumor cells Cancer Lett 2001; 165: 71-9. Apostolopoulos J, Sparrow RL, McLeod JL, et al. Identification and characterization of a novel family of mammalian ependymin-related proteins (MERPs) in hematopoietic, nonhematopoietic, and malignant tissues DNA Cell Biol 2001; 20: 625-35. Suárez-Castillo EC, Medina-Ortíz WE, Roig-López JL, García-Arrarás JE. Ependymin a gene involved in regeneration and neuroplasticity in vertebrates, is overexpressed during regeneration in the echinoderm Holothuria glaberrima Gene 2004; 334: 133-43. Suárez-Castillo EC, García-Arrarás JE. Molecular evolution of the ependymin protein family: a necessary update BMC Evol Biol 2007; 7: 23-42. Shashoua VE. The role of brain extracellular proteins in neuroplasticity and learning Cell Mol Neurobiol 1985; 5: 183-207. Schmidt R, Brysch W, Rother S, Schlingensiepen K-H. Inhibition of memory consolidation after active avoidance conditioning by antisense intervention with ependymin gene expression J Neurochem 1995; 65: 1465-71. Schmidt JT, Shashoua VE. Antibodies to ependymin block the sharpening of the regenerating retinotectal projection in goldfish Brain Res 1988; 446: 269-84. Thormodsson FR, Antonian E, Grafstein B. Extracellular proteins of goldfish optic tectum labeled by intraocular injection of 3H proline Exp Neurol 1992; 117: 260-8. Königstorfer A, Sterrer S, Hoffmann W. Biosynthesis of ependymins from goldfish brain J Biol Chem 1989; 264: 13689-92. Hoffmann W. Goldfish ependymins: cerebrospinal fluid proteins of meningeal origin Prog Brain Res 1992; 91: 13-7. Tang S-J, Sun K-H, Sun G-H, Lin G, Lin W-W, Chuang M-J. Cold-induced ependymin expression in zebrafish and carp brain: implications for cold acclimation FEBS Lett 1999; 459: 95-9. Yurchenco PD, Schittny JC. Molecular architecture of basement membranes FASEB J 1990; 4: 1577-90. Lakowicz JR. Principles of Fluorescence Spectroscopy. London: Plenum Press, New York 1983. Hutnik CML, MacManus JP, Banville D, Szabo AG. Comparison of metal ion-induced conformational changes in parvalbumin and oncomodulin as probed by the intrinsic fluorescence of tryptophan 102 J Biol Chem 1990; 265: 11456-64. Engel J, Taylor W, Paulsson M, Sage H, Hogan B. Calcium binding domains and calcium induced conformational transition of SPARC/BM-40/osteonectin, an extracellular glycoprotein expressed in mineralized and nonmineralized tissues Biochemistry 1987; 26: 6958-65. Sage H, Vernon RB, Funk SE, Everitt EA, Angello J. SPARC, a secreted protein associated with cellular proliferation, inhibits cell spreading in vitro and exhibits Ca2+-dependent binding to the extracellular matrix J Cell Biol 1989; 109: 341-56. Maurer P, Mayer U, Bruch M, et al. High-affinity and low affinity calcium binding and stability of the multidomain extracellular 40-kDa basement membrane glycoprotein (BM-40/SPARC/osteonectin) Eur J Biochem 1992; 205: 233-40. Chen Y, Bal BS, Gorski JP. Calcium and collagen binding properties of osteopontin, bone sialoprotein, and bone acidic glyco-protein-75 from bone J Biol Chem 1992; 267: 24871-8. Thormodsson FR, Parker TS, Grafstein B. Immunochemical studies of extracellular glycoproteins (X-GPs) of goldfish brain Exp Neurol 1992; 118: 275-83. Maurer P, Hohenester E. Structural and functional aspects of calcium binding in extracellular matrix proteins Matrix Biol 1997; 15: 569-80. Nicholson C. Modulation of extracellular calcium and its functional implications Fed Proc 1980; 39: 1519-23. Benninger C, Kadis J, Prince DA. Extracellular calcium and potassium changes in hippocampal slices Brain Res 1980; 187: 165-82. Krnjevic K, Morris ME, Reiffenstein RJ. Stimulation-evoked changes in extracellular K+ and Ca2+ in pyramidal layers of the rat's hippocampus Can J Physiol Pharmacol 1982; 60: 1643-57. Pumain R, Heinemann U. Stimulus- and amino acid induced calcium and potassium changes in rat neocortex J Neurophysiol 1985; 53: 1-14. Pumain R, Kurcewicz I, Louvel J. Ionic changes induced by excitatory amino acids in the rat cerebral cortex Can J Physiol Pharmacol 1987; 65: 1067-77. Shashoua VE. Monomeric and polymeric forms of ependymin: a brain extracellular glycoprotein implicated in memory consolidation processes Neurochem Res 1988; 13: 649-55. Kouznetsova I, Chwieralski CE, Bälder R, et al. Induced trefoil factor family 1 expression by trans-differentiating Clara cells in a murine asthma model Am J Respir Cell Mol Biol 2007; 36: 286-95.